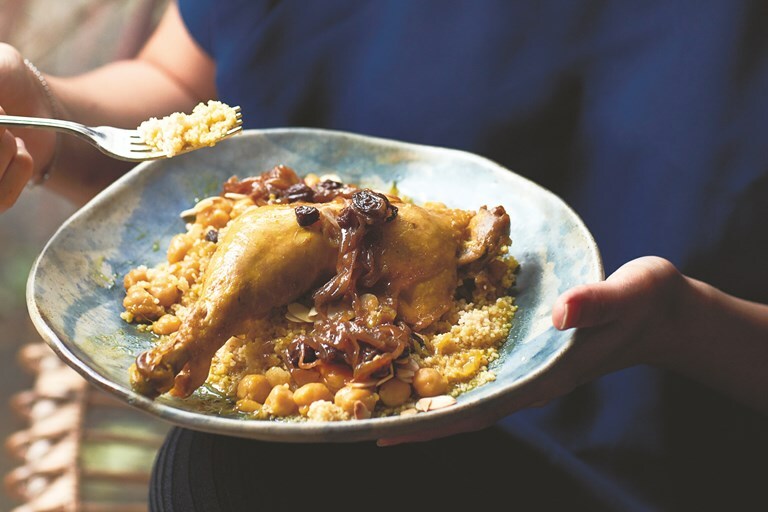 This chicken couscous recipe originates in the Moroccan city of Fes (or Fez). Full of warming spices and fragrant saffron, it's finished with a tfaya sauce, which is flavoured with caramelised onions, honey and raisins. This recipe is taken from Casablanca: My Moroccan Food by Nargisse Benkabbou (Mitchell Beazley, £20). Image by Matt Russell. This couscous is very special to me, and it used to be my favourite couscous when I was a child. Both my parents are from Fes, where tfaya originates and I spent the majority of my childhood holidays there with my mum, grandmother and aunts, wandering around the souk of the old medina or watching them cook gigantic feasts. The whole recipe is really easy to prepare and doesn’t require more than an hour’s cooking on the hob. Nargisse Benkabbou is a London-based food blogger and author. While growing up in Brussels, her parents filled their kitchen with the flavours of their native Morocco, instilling in Nargisse a passion for exploring her culture through food.